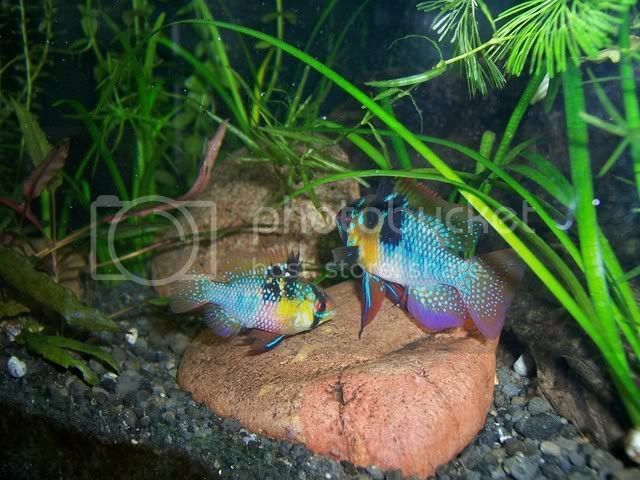 Here are a few pics of my German Blue Ram pair. very pretty. very nice colours as well. mines a fair bit older than yours though, his dorsal spikes at the front nearly reach the end of the dorsal fin. they seem pretty fond of that rock. maybe a spawning site soon. What gorgeous fish!! So healthy looking. - great fish btw, and is it just me, or is one a bit bigger than the other? I know everyones already used the word GORGEOUS! So I'll call them SPECTACULAR! Here is the best pic I took of them, with the female on the left and male on the right. msta, the female is a bit smaller than the male. This pair has spawned a few times for me, but the fry have never made it. Thanks for the kind words. I really enjoy this pair a lot. Not sure where they were breed.